G.W. 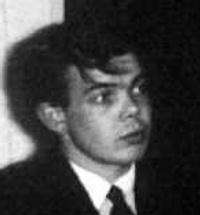 (Bill) Hopkins (5 June 1943 – 10 March 1981) was a British composer, pianist and music critic. Hopkins was born in Prestbury, Cheshire and educated at Rossall School, Lancashire; his mother's learning difficulties meant she was unable to look after him, and he was raised by aunts. An encounter with Luigi Nono at Dartington consolidated his interest in serialism; subsequently he studied at Oxford University with Edmund Rubbra and Egon Wellesz. In 1964 he went to Paris, ostensibly to study with Olivier Messiaen but with the prime objective of meeting and studying with Jean Barraqué. Returning to England, he supported himself as a music critic in London and then, after moving first to Tintagel, Cornwall and subsequently to Peel, Isle of Man, by translation and writing music criticism. He married Clare Gilbert in 1972. Subsequently, he taught at Birmingham University and University of Newcastle upon Tyne before succumbing to a heart attack, in Chopwell, near Newcastle, at the age of 37. His few pupils included the British composer Paul Keenan. He was upset at an under-rehearsed first performance of 'En Attendant' in 1977 and this possibly discouraged him from composition for a while. He was working on an opera project, tentatively called Ness, but little if any of this was completed. Sensation. Soprano, tenor sax, trumpet, harp, violin. 1965, first performed 1965. Etudes en serie. Solo piano. 1965–72, first complete performance 1997. Pendant. Solo violin. 1969, rev 1973, first performed 1975. Nouvelle etude hors serie. Solo organ. 1974, first performed 1993. En Attendant. Flute, oboe, cello, harpsichord. 1976–77, first performed 1977. His complete piano works have been edited and recorded by Nicolas Hodges, (col legno, 2000). En Attendant, Two Pomes, Pendant and Sensation have been recorded by Music Projects/London and Richard Bernas, (NMC, 1992). ↑ "Bill Hopkins & Anthony Gilbert - Sensation & other works". NMC. Retrieved 5 January 2010.